Gennadii Donchyts is a senior consultant at Deltares. He has over 15 years of multidisciplinary experience in the development of environmental modeling software. He was involved in many international projects focusing on the design of software and numerical model for flood forecasting, water quality and water resource management. He was involved in the development of hydrological dispersion module of RODOS – real-time online decision support system for nuclear emergencies, the main product of a several large European Union projects. He developed a set of software tools used for the simulation of a radioactive pollution transport in aquatic pathways, including development of the one-dimensional CFD simulation code for water flow, sediments and radioactive pollution transport in river networks. 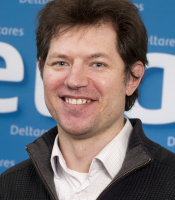 Since 2006, he has been working for Deltares. His main area of expertise is design and development of the software tools and algorithms for the setup and use of environmental models, including coupled models. He is the original author and the lead architect of Delta Shell – a new integrated modeling system of Deltares. His current interests involve development of the model coupling frameworks, open-source geospatial libraries for .NET, scientific visualization and interactive modeling components and the design of graphical user interfaces. Gennadii is a member of the technical committee of the OpenMI Association and OGC Technical Representative at Deltares. Since 2013 Gennadii is pursuing a PhD at the Technical University of Delft, faculty of Civil Engineering. The working title of the research is “Rapid setup of interactive coupled surface and subsurface models using open earth observation data”. Design, development of Delft-FEWS system components using J2EE/J2SE. Software Architect. EURANOS Project, Development of the RODOS decision support system for nuclear emergencies, re-design of the graphical user interface. ViSKon ApS Denmark/Asia Water & Environment Malaysia, Multi-Disciplinary Assessments for Loagan Bunut National Park (Sarawak) and Klias Peninsula (Sabah). Geospatial processing, remote sensing, software and 1D water quality river model development.